I've been asked quite often to post more commented chess videos, so I have a new one for you! It's my game against the Spanish lady champion, Monica Calzetta. It was the first round of the recent European Team Championship in Novi Sad. 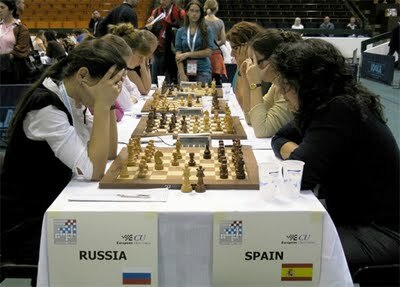 I was playing on the first board of the Russian Team (my team mates were Tatiana and Nadezhda Kosintseva and Valentina Gunina) and Monica was playing on the first board of the Spanish Team (Her team mates were Sabrina Vega, Natalia Pares and Patricia Llaneza). I posted the moves to that game in a previous post. If you have a login to YouTube, feel free to go directly to my channel "ChessQueen", where I have many other nice commented chess videos. I am grateful when you give a 5-star rating to my videos and leave any comment below the video, I always do my best to answer them. Here is the direct link to my Kosteniuk - Calzetta video. Beautiful game, impressive decision to go 0-0-0 and King-side attack.